Chusquea culeou is a South American native that grows in the lower elevations of the Andes Mountains, primarily in southern Chile. It can grow to a mature height of about 15′, with a spread of about 5′ within 4 – 5 years. This bamboo has a columnar to vase-shape form as a mature plant. The short branches are nearly whorled around the culm lending a tufted or plume-like appearance to the foliage (thus the common name Chilean Feather Bamboo). This bamboo can also offer some spectacular seasonal color. In early spring, the culms can turn a range of colors ranging from magenta to chocolate-burgundy. Color is most dramatic when the plant is sited in full sun. Like most all temperate clumpers, this bamboo requires cool summer nights to survive and thrive, so the lowland climate of Western Oregon is ideal for growing this bamboo. For the most vigorous growth, plant it in full sun, in rich moist soil, and give it plenty of room to grow. 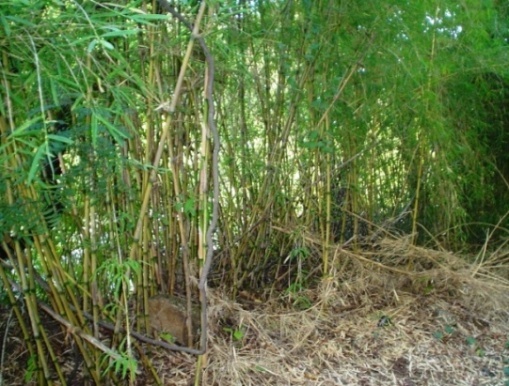 Chilean Feather Bamboo is a clumping bamboo, but gets taller and spreads more quickly than most other clumping bamboos. For the best performance and least maintenance, you should set aside an area of garden space at least 6′ in diameter.